One of the biggest investment man has are their homes, and termite infestations is an egregious threat to it. 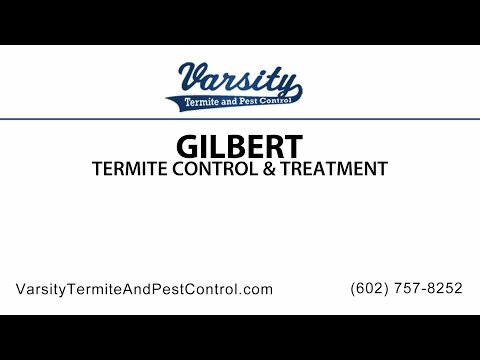 In order to battle subterranean termite infestations in Gilbert homes, consumers must consider the various types of treatments they will employ when faced with this minute, yet tremendously stressful, problem. There are three common types of treatment options and these are termite bait technology, use of borate wood treatments, and chemical barrier treatments; all of which are proven to be effective when applied properly. Among these treatments, we will focus on chemical termite barriers. Chemical termite barriers are also known as liquid termicides. It is applied around the foundation of infrastructures to defend and barricade access to termites, preventing the little monsters from forming colonies and consequently, destroying the structure. The advantage of the use of this treatment option is being rapid and relatively long-lasting. It is salient the application of the barrier is done meticulously and ensure that it is intact and complete. Moreover, the barrier must remain undisturbed and that the environment surrounding it must be kept from above ground moisture. As for its longevity, liquid termicides last for about five years or more. Liquid termicides last for at least five years when properly installed according to label directions. However, there are different factors that affect the actual length of control on a given structure. Of course, proper application is a key component as mentioned above, environmental conditions as well, and the population of the termite within the area. Once it is suspected that the building is infested with termites, this will be due to the degradation of the barrier and the critters have found a gap. On the other hand, there are still downsides to this type of treatment. Since it only acts as a barrier or a wall that keeps termites from invading the infrastructure, any disturbance in the barrier or faulty application would make it less effective and eventually, the termites would be able to gain access. Furthermore, it does not kill the remaining colonies surrounding the vicinity. If you are more inclined with choosing soil-applied barriers, it is advisable to hire professional Gilbert termite help as the application is tedious to ensure the effectiveness of the treatment. Although barriers do not get rid of the surrounding colonies and generally excludes termites in the ground from entering buildings, there are several improvements in their technology that makes it an effective termicide. Most former products were repellent rather than lethal to termites burrowing through the soil; it only traps the termites inside the building and will eventually die since they cannot return to the soil. But technological advances have improved which makes it non-repellent and toxic to termites tunneling their way into the structure. Apart from acting as a barrier, this type of chemical termite barrier products can also kill the termite. Generally, they are considered to be effective. As for the health risks that the use of chemical termite barriers may entail, most products, prior to being registered are thoroughly tested and have resulted to negligible effects to human health. Modern products nowadays are odourless and are generally safe to use around humans. Contact us today!